A new Honour Board has been installed in the Broken Hill Hospital to acknowledge donations to the service with a late Health Council member’s bequeath the first to be displayed on it. The family of the late Brian White donated $5,000 to the Broken Hill Health Service in memory of his contribution to the health service, including being a past BH Health Council Member and Treasurer. Mr White passed away in 2014. The White family’s donation was used to buy a Journey Board monitor in Surgical Ward. Mr White’s family requested a plaque be put on the machine acknowledging the donation, but the monitor is in a location not visible to the public view. The Health Service with agreement from the Health Council decided to install an Honour Board in the hospital foyer to record the White family donation and other donations valued $5,000 or more. The Honour Board was officially dedicated today, with Mr White’s widow Mrs Pam White in attendance along with Health Council members and Broken Hill Health Service staff. “Mr Brian White served on the Broken Hill Health Council for many years including in the important role as Treasurer. His contribution to the health service in that role was valuable and very much appreciated,” said Mr Ken Barnett, General Manager BH Health Service. “It is truly fitting that the plaque acknowledging the White family donation is the first on the new Honour Board,” he said. 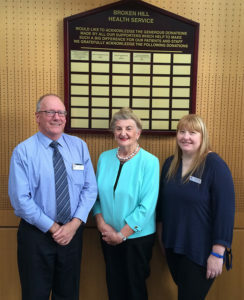 The new Honour Board was dedicated by the widow of Brian White, Mrs Pam White (centre) and Broken Hill Health Service General Manager, Ken Barnett and Chair of BH Health Council, Ms Karen Gosling.